In Hans Christian Andersen’s tale, Den lille Idas blomster (Little Ida’s flowers, 1835), the young Ida is told that if the flowers seem to be so alive it is because they dance all night long. 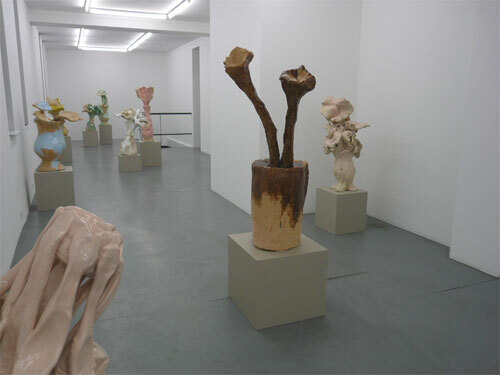 Clémence van Lunen’s latest ceramics flowers, with their immoderate volumes, their distended shapes, seem to be alive and larger than life. Humorous, mischievous, these oversized floral arrangements stand up to academic standards. As do the numerous areas of raw clay left uncovered before firing and further appear through enamel which flows like a sweet coloured sap. Clemence van Lunen didn’t choose these soft colours randomly. They add audacity to the insolence given by the artist to petals and stems. The stems seem to be vases with exaggerated shapes or is it the vases that take the shape of curved, bulging, unsteady stems? Fleeing from lessons of realism, with the series Wicked Clémence van Lunen reveals the immense pleasure she experiences when modelling clay into voluptuous shapes, and the power of the irony which reside in her works.